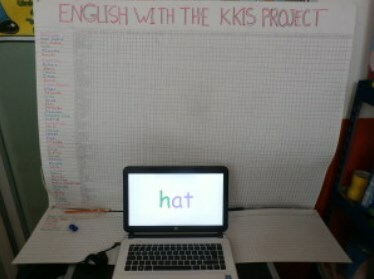 Today was the first day that KKIS volunteers did not work with the children at the DIF School with the computer-based BrillKids English language curriculum Little Reader, donated by EEECF through LLI-Mexico. We have gone every morning, set up the computers and sat with two kids at time teaching them to use the system. Yesterday we explained to Lupita, the supervising teacher, that we would not come again until Tuesday when a group of volunteers would spend time with the students in small groups teaching conversation skills. We left the computers in her care and hoped for the best. I decided I needed some exercise this morning and walked over the school with a huge inflatable globe that was donated to KKIS by our friend Dr. Jane. The math teacher has been teaching the states of Mexico and their capitols from the map above the white board in the front of the classroom and Lupita asked if I could get a map of the world. At any rate I walked over hoping to find the math teacher but he was not there yet. But surprise of surprises: both computers were set up with two kids working at each of them. No other children were in the classroom or in the courtyard but these kids were going to town! So I guess our training worked and they are on their way. I gave the globe to Lupita who was delighted with it and told her we would see her next week on Tuesday and Thursday from 11 – 12 for classes of conversation. Then I smiled all the way home. This entry was posted in Mexico and tagged BrillKids, Foundation, KKIS, Little Reader, LLI, lli-mexico, Mexico, sponsorship. Bookmark the permalink.